Our global economy relies on ships to transport cargo, people, and even weapons. Although the flow is never-ending, individual ships only last so long. When a cargo ship becomes too expensive to maintain and repair after about 25-30 years in service, shipping companies decommission it and have it scrapped for the valuable metals aboard. The same is true for any type of ship, including cruise ships. Old ships are a valuable source of scrap steel for construction industries. 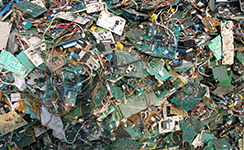 Recycling ships recirculates these metals throughout the economy for reuse. These are dangerous substances that must be managed properly to avoid any potential negative environmental and human health impacts. Because ships contain these toxic components, old ships are hazardous waste. The United Nations Basel Convention, which restricts the global trade of toxic waste, restricts the trade of old ships. BAN aims to ensure that old ships are recycled responsibly, instead of exported to less developing countries, as outlawed by the Basel Convention. We also aim to help the US Navy recycle their old naval vessels responsibly, instead of sinking them in the oceans. A worker using a blowtorch at night. Copyright Pierre Torset. See more of Pierre’s shipbreaking photos here. Too often, instead of having ships recycled at dry-dock ship recycling facilities that properly manage these toxic chemicals, companies offload ships to beach shipbreakers in developing countries. Companies cut costs by exporting ships to impoverished countries, taking advantage of their lax labor laws, weak environmental regulations, and poor human rights track records. This toxic trade disproportionately burdens the poorest of the poor with the world’s toxic waste. Companies sail these huge vessels at full speed onto beaches in Bangladesh, India, and Pakistan. When the tide recedes, locals dismantle the ships for almost no pay. Across South Asia, once pristine beaches are now toxic shipbreaking yards. At high tides each month, companies sail huge vessels at full speed up onto the shores. When the tides recede, local workers begin tearing the ships apart, piece by piece. Without safety gear – in baseball caps and flip flops, or boots if they’re lucky – boys and young men cut wires, blast through ship hulls with blowtorches, and haul huge pieces of scrap metal using their bare hands. Lacking basic occupational health and safety precautions, the number of injuries and deaths among workers is high. The International Labour Organization considers beach shipbreaking one of the most dangerous jobs in the world. The toxins that poison workers also poison beaches. These delicate, intertidal costal zones are especially ecologically fragile, yet beach shipbreaking companies don’t take any precautions to protect them. Many toxins soak straight through the soft sands, polluting the water and washing out to sea. Local waterways are cloudy with particles, far from the picturesque image of a beach with clear, turquoise-blue waters. In Bangladesh alone, 21 species of fish have gone extinct and 11 have become endangered due to shipbreaking. Fortunately, there’s a viable alternative to dangerous shipbreaking: responsible ship recycling. Instead of dismantling ships on beaches, letting toxins flow out to waterways, and endangering the lives of their labor force, ship recyclers have dry-dock facilities that capture toxic waste and proper safety procedures that protect workers. Ship recycling facilities like this exist right here in the United States, in Texas, Louisiana, and Maryland. The more ships these facilities recycle, the more green jobs they create. Protecting the environment from toxic ships comes with the added bonus of creating more green recycling jobs. BAN’s green ship recycling program advocates for responsible recycling that ensures proper management of toxins and respects human rights. BAN raises awareness of shipbreaking issues, including tracking ships about to be sent to shipbreaking yards. We advocate against shipbreaking and for responsible recycling. We’re a member of the NGO Shipbreaking Platform, a global coalition of environmental, human rights, and labor rights organizations also preventing ships from being beached in developing countries. We also encourage shipping companies to take the Off the Beach! pledge to use responsible recycling facilities for their decommissioned fleet. We promote recycling as the true solution for the US Navy’s old vessels. Too often, the Navy sinks old vessels for target practice, a practice called sinking exercise, or SINKEX for short. Sinking these ships means the toxic materials aboard aircraft carriers, minesweepers, and more end up in the oceans, polluting our waterways and even our food web. Over the years, our continued advocacy with the Environmental Protection Agency (EOA) and the Maritime Administration (MARAD) has created greater coordination between the two groups, which means more gets accomplished faster. Globally, 1026 ships were dismantled in 2014. To date, BAN’s green ship recycling campaign has prevented 17 cargo and US Navy ships from being beached or sunk in the ocean.